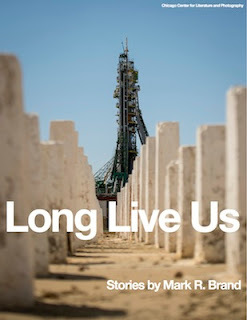 Mark R. Brand: Long Live Us is here! The hard copies are gorgeous, and CCLaP has come a long way since the earliest days of the hand-stitched "hypermodern editions" with these. The new hardcovers have closed spines and wrap-around cover images, and are available in about 25 bookstores nationwide and at their website. I would suggest checking out their Kindle, iBooks, and PDF versions as well, if only because Pettus is a master of digital publishing and CCLaP is known for putting out some of the best looking eBooks in the business. A family tensely waits out a meningitis scare in a quarantined home during the Great Recession. Small-town farmers in pre-war America battle a tree the size of a skyscraper. In a day-after-tomorrow dystopia, the new naughty contraband among rebellious teenagers is starchy carbohydrates. And in a barely recognizable far future, enlightened humanoids debate the implications of a mother who has smothered her child. These are just some of the speculative visions collected in the new Long Live Us by Chicago writer Mark R. Brand, author of the previous CCLaP hit Life After Sleep. Known primarily as a science-fiction author, this new collection will certainly not disappoint Brand's existing fans, with pieces set among lunar colonists and blue-collar astronauts among other fanciful situations; but this is also Brand expanding his scope and vision for the first time, treating us with more down-to-earth stories set among contemporary families and even offering up a Great Depression tall tale. A multiple past winner of the Independent Publisher Book Award, Brand is at the height of his creative power in Long Live Us, and the stories found within are sure to delight, disturb and thrill you long after you've finished reading.